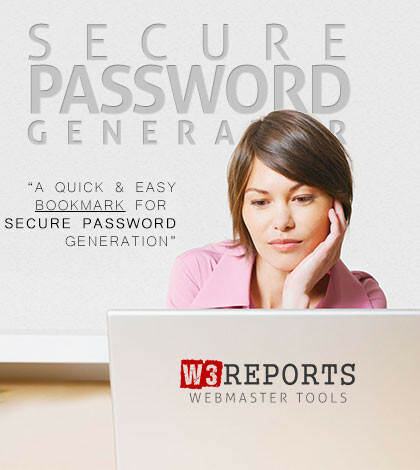 W3Reports Secure Password Generator is designed as a quick and easy way for webmasters to create strong secure passwords using uppercase, lowercase, numbers and symbols. Unlike traditional password generators where you are allowed to set specifications this page will randomly generate 5 passwords using different generation methods including random.orgs truly random API. Using a strong and secure password reduces the risk of your accounts being compromised, however there are no guarantees. Ultimately security lies within the system guarding it as well as user habits. Our generator simply offers an additional layer of security. Don’t like the passwords that you see? Just reload the page and 5 new random passwords will be generated.